You may occasionally wish to switch out shoats, as some puppies get bored with a shoat that they are familiar with. Hog hunting is a sport that relies on fast, smart dogs who can make good decisions and know how to track a hog. 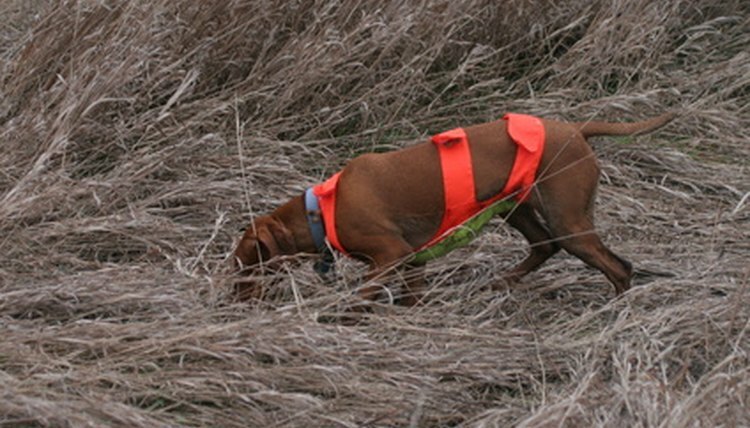 Individual hog hunters will value different traits in their hunting dogs, but they all agree that early training is important. Purchase a shoat (young pig) that is about the same size as your puppies or even a little smaller. Your puppies should be between 2 and 3 months old before you begin this procedure. Remember that the shoat should not be large or threatening to your puppies. Put the shoat on a leash and walk it by the pen where you are keeping the puppies. Chances are good that your puppies are going to be strongly interested in the shoat. Repeat this a few times. Keep an eye out for puppies that seem especially enthusiastic. Introduce your puppies to the shoat in a controlled environment where they are comfortable. This might be the yard or any place where they like to play. Do this for roughly a week, until the puppies are very interested in your shoat. At this point, you should be able to weed out puppies who are not interested in hogs. Take your puppies to the woods and show them the stoat. You are making them realize that the shoat is associated with the woods, and that going for a ride in the vehicle means that they are going to be getting to see the shoat. Repeat this a few times. Take your puppies and the shoat to an overgrown field or lightly wooded area. Put on a pair of rubber boots. You want the puppies to follow the scent of the shoat, not your scent. Show your puppies the shoat and get them very excited about it. Do not let them out of their box yet. Leash the pig and walk it through the field, going through tall grass and around the trees. Restrain the pig with a hog hobble so that it cannot get away. It should be positioned at a place that is some distance from your puppies. Let your dogs out of their box. Observe your puppies and see which ones immediately start casting around for scent and which ones are simply following their littermates. Encourage them to find the scent and to work through it. The first time that they do this, they are going to be slow and fairly clumsy, but the next time it will be faster. You may need to walk them to the pig the first time, but then they will associate the experience with the pig and be more aware of what is required. Praise your dogs when they find the pig. Repeat steps 5 through 13 until they are about a year old, at which point, they'll be ready to take hunting.